In a recent survey, 99.9% of those reached responded that the clinically proven medicated ingredients of La Purga de San Benito ameliorated their cravings for Wiener Schnitzel. These folks were willing to send personalized affidavits to that effect. I invented the above paragraph. La Purga de San Benito is a Spanish expression for a cure-all miracle drug that does not exist. The other word that has a definite meaning is affidavit. But I have never accepted the meaning behind medicated as it means nothing. A medicated substance is not a medicine. I have often wondered why the 99.9% pure ivory soap that floats is not 99.8 or 100% pure. Why is it that those recent surveys never tell you when it occurred or where and by whom? And what is clinically proven? And yet as my wife Rosemary and I try to avoid the ads between listening to Rachel Maddow on MSNBC we are sent a barrage of those terms that have no meaning. I end up clinically depressed. To the nonsense words above I want to add another one. The word is personalized. 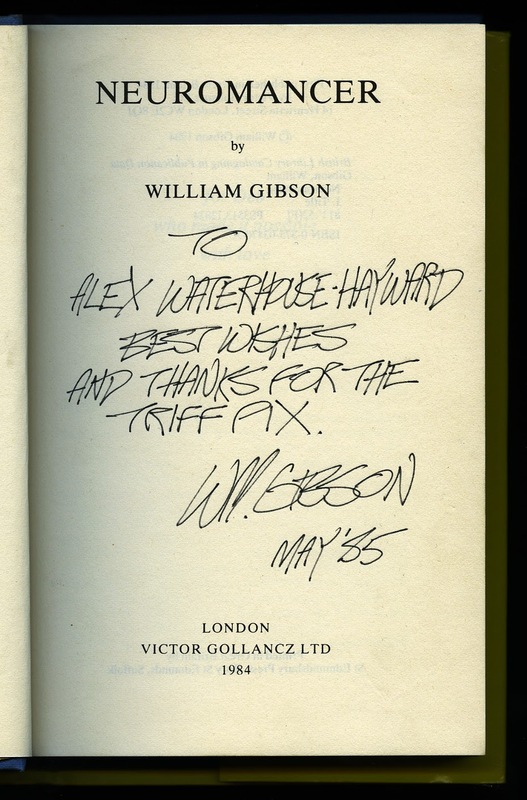 It cannot be because Gibson gave me the book, I did not buy it. Can it be personalized? If I write my name on the book to signal that I am the owner is it personalized? Can it be dedicated? Perhaps, but exactly what does that mean? I took my personal copy of Peter Beales’s Classic Roses a few years (before he died) when he came to Vancouver and asked him to dedicate it to my granddaughter Rebecca who was not there. If my Neuromancer is signed what can you say of all that extra stuff? You can routinely go to a big box bookstore and find a shelf full of already signed novels by famous authors. 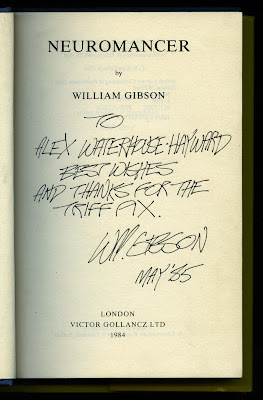 I would like to point out that my first edition Neuromancer is worth more than $1000 but that it would be worth more if it had not been “written upon” by the author to that unknown person that I am. And had I not opened the book at all, it would have been then be worth even more. An unread book can be priceless to the buyer and the seller. But what of the reader?